Elevators, five-car garages and home theaters are among the luxurious features in this week’s most expensive home sales in metro Phoenix. Patrick O’Malley and his wife, Diane, purchased this French-style mansion in Paradise Valley’s Turquoise Hills community. The 9,830-square-foot house has five bedrooms and seven bathrooms. The house has solid masonry construction and ornate finishes throughout. The home also feature unobstructed Mummy Mountain views from the backyard and every south-facing window and door. The home has a multilayered roof system, a 9.2 kilowatt solar photo-voltaic system, two solar water heaters and the use of a private well for irrigation. MGIC 3 LLC, an Arizona limited-liability company, sold the house. Todd Hobgood, a plastic surgeon practicing in Scottsdale, and his wife, Katie, purchased this mansion in Paradise Valley’s Mummy Mountain Vista. The 7,600-square-foot Santa Barbara-style house has five bedrooms and 5½ bathrooms and sits behind a private gate. The house has a unique interior courtyard with a fireplace, a bonus/game room, 10-foot bifold doors, and a five-car garage with attic storage. The house has a wet bar with built-in ice maker and wine fridge, a resort-style backyard with swim-up bar under a ramada, misters and two built-in barbecues. Christine and David Kingen sold the home. William Abbott and his wife, Cindy, purchased this house in Paradise Valley’s Village at Mountain Shadows community. The 5,001-square-foot contemporary-style house has five bedrooms, 5½ bathrooms and an elevator. The house sits at the base of Camelback Mountain and is a custom two-story with a full basement. The main level features a gaming lounge with full wet bar and a covered patio area. The upper level features motorized pocket doors that lead out to a deck, a spacious kitchen with Wolf stainless steel appliances, a kitchen island, eat-at bar, walk-in pantry and a formal dining nook. The master suite has a walk-in closet and an office. The basement has its own theater room, exercise room and card lounge. The grounds have water features and fountains in the front yard. MTS Builders LLC, an Arizona limited-liability company, sold the house. Gary Hoover, former vice president of Tenaska Inc., and his wife, Donna, purchased this house through their trust in Scottsdale’s Ancala community. The 8,000-square-foot Tuscan-style mansion has five bedrooms and eight bathrooms and opens to a private courtyard and has stone accents. The house is fitted with wood beams, barrel ceilings and handcrafted millwork throughout. The house has a game room with wet bar, a two-tier theater and a gourmet kitchen. It also comes with its own guest casita with its own living room, kitchen, master suite, bath and a walk-in closet. The backyard has multiple covered patios, two exterior fireplaces, negative-edge pool, spa and mountain views. The house also has a five-car garage and a large motor court. John and Leslie Brown sold the home. John and Mary Cooper paid cash through their trust for this condominium in Scottsdale’s Optima Kierland community. The new luxury condominiums are one- to four-bedroom and penthouse condominium homes, conceived by architects David Hovey and David Hovey Jr. 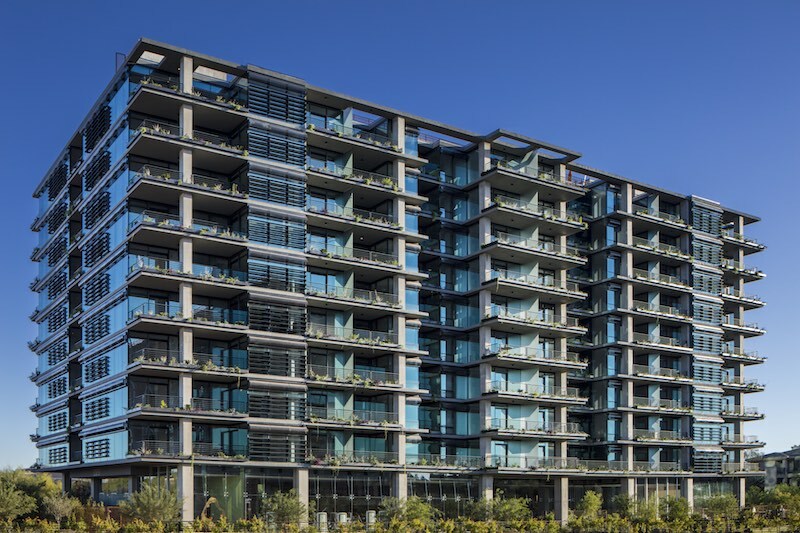 The condominiums have vertical landscape and shading systems to protect residences from the sun, create privacy and lower the ambient temperature. The complex offers private terraces, a 5.5-acre private park, a 16,000-square-foot fitness level and a rooftop pool. Optima Kierland sold the home.